More and more over the last few years I’ve found myself in remote places with a handful of close friends wondering, “How did I get here?”. It’s never a short answer. Most recently, this happened when I was ankle deep in ocean mud and squinting at the sun’s reflection off the Sea of Cortez in rural Mexico. The date was February 11th, 2019. 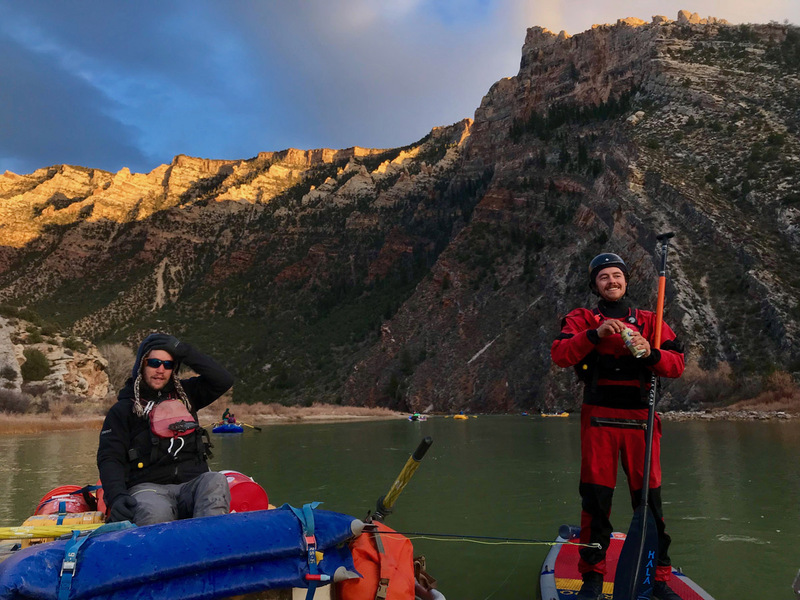 I had been travelling with my friends Bobby and Bridget for nearly five months down the Green and Colorado Rivers and we had finally reached the historical end to the river. It’s a strange feeling: seeing a body of water transform, grow, shrink, and then reach the “finish line”. I don’t think we wanted to admit that the journey was over. When I explained my winter plans to friends and family almost everyone asked some version of the question. “Why?” Long before the trip even began, I had also been questioning what I was doing embarking on a five month winter paddleboard trip through some of the harshest environments in the country. It might not have been until the very moment that I saw the ocean – the moment when I was standing in the briney mud with seagulls flying overhead – that I realized why I had come so far. I’m still reflecting and wrapping my head around these thoughts, but the more time goes on, the closer I am to understanding why anyone embarks on extended, outdoor expeditions like this one. Here are the best answers I have for why I SUPed from Wyoming to Mexico. Why Paddle the Source to Sea? I’ve been paddling rivers long enough to become curious about what lies at the very beginning and at the very end. There’s a whole lot of water in between and for me, seeing the entire thing is a fascinating idea. Also, as a passionate backcountry traveller who is enthralled by dramatic landscapes and waterways, I became obsessed with the idea of living on a river for five months. Recently, I have found that my happiness and health directly correlates with how much time I spend outside. I am grateful for a seasonal employment schedule that allows me to spend large chunks of my time in the wilderness. While paddling the Source to Sea, we became pretty addicted to floating past boat ramps and typical river takeouts. We’d see the parking lots, friends would depart, but Bobby, Bridget, and I would always continue down the river. It’s a powerful feeling. Our determination to continue doing this helped us reach the ocean. For the record, a true Source to Sea of the Colorado actually starts at the headwaters of the Green River in Wyoming, as this is the longest path to the ocean. It’s possible that no other natural geographic feature connects the Western United States, both literally and metaphorically, better than the Colorado River. The saying often goes that while it isn’t the biggest or longest river in the country, it might be the most important and hardest working. It’s the river that helps to feed America with a steady drip of runoff from the Rocky Mountains. It’s a resource that is used repeatedly and continuously by every group in the country. From old to young, liberal to conservative, anglers to whitewater enthusiasts, we all share a love for the river. The Colorado also goes through constant change on its way to the sea. We portaged 11 dams in the United States and over 20 in Mexico. The river dies in reservoirs, but always comes back to life below the dam. The scenery, transformation, whitewater, and remoteness of the Colorado were the best reasons for why we chose this river over others. Before I started bumping and dragging a SUP down the low volume headwaters of the Green River, I had only spent a handful of days on a paddleboard. The truth is, I don’t really have a good answer for I did this trip on SUP. Most likely, I was sitting on a friend’s porch in Salt Lake City, had a few too many libations, and somebody suggested that I try and SUP the Source to Sea of the Colorado. I got attached to the idea and decided to go for it. While I was probably the first person to do this trip on a SUP, I hope I’m not the last. Paddleboarding has many benefits that I learned about firsthand. Most importantly, I realized that SUPs are versatile: they can be rigged as easily for a multi-day whitewater trip as a single day of flatwater paddling. Standup paddleboarding, it turns out, is also incredibly fun. I hope to see more people embarking on long SUP trips; the possibilities are endless! When I’m not on a paddleboard, I work as an outdoor educator and I often find myself preaching this quote to my students. They are words that defined my life before I ever heard them. I believe that nobody really knows what they are capable of until they dream big, work hard, and try something new. And even though it wasn’t the motivation for starting the trip, my Source to Sea SUP expedition reassured my belief that anything is possible when I surround myself with people who support me. While I stood in the Sea of Cortez and felt the cold ocean cover my toes with its beautiful, salty water, I realized that the most important reason why we went on this trip was because adventure for the sake of adventure is a perfectly good reason to do anything. I’ll never regret time spent with my close friends exploring new places.